Submitting top-notch marketing documents is critical to ensure a quick and successful job search. In various school districts the competition for the best teaching positions is fierce. This means you must set yourself apart from the rest of your competitors. A mediocre resume will not suffice; you need an outstanding resume and cover letter. The resume and cover letter are the documents that market your skills and expertise in your absence. Therefore it is vital that you devote quality time to the creation of these documents. The presentation of your resume. Think of it this way: when you go shopping, chances are you make a purchase because you have seen the product advertised. What grabbed your attention? The ad? The product description? The benefits? Or the packaging? Approach the presentation of your resume in the same manner. Your resume should serve as an advertisement that highlights your relevant skills and accomplishments while answering the employer's burning question: "What can this candidate do to solve our current employment vacancy?" Make sure your information is organized. The information presented in your resume needs to be concise and easy to read. Create a highly visible and attention-grabbing summary section at the top of the first page. Remember, you only have five to twenty seconds to grab the reader's attention - make it count! This summary section is the place to include some keywords, without being too obvious. You may have the best credentials and accomplishments for the position, but if they are poorly presented, you can easily be overlooked. Sell the reader with compelling content. Don't simply TELL the reader what you have done, SELL the reader what you have done. This key distinction will be the deciding factor in securing an interview. Be sure to write powerful statements that match your skills, abilities, and qualifications with the district's needs. Many job seekers have difficulty selling themselves and emphasizing their skills in relation to the position when writing their resume. This is because it is difficult to act as an objective third party. Resume writing is a very different form of writing - a style that most people do not use daily - it is an art! It is a well-known fact that employers hire candidates with a pleasing personality. The words you use in your resume can convey your amicable nature, thus setting you apart from the other candidates. Use vocabulary that will interest the reader, as opposed to dull sentences that will send your resume to the "NO" pile. Show your passion for education and students... and of course let your positive attitude shine through. Your documents must demonstrate your expertise and display your greatest achievements. 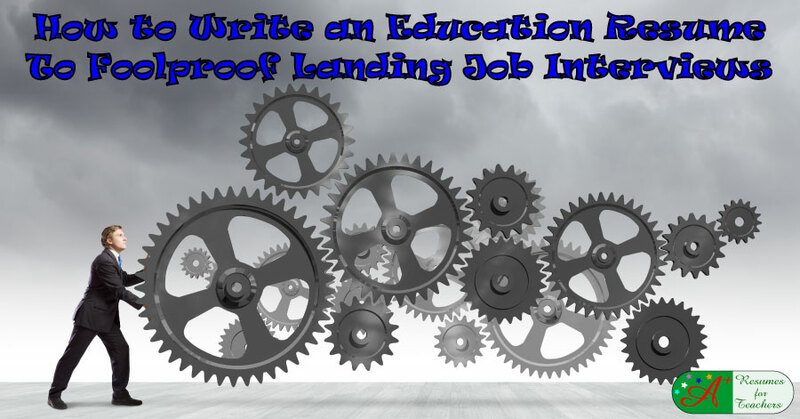 To ensure professionalism, send a cover letter addressed to the correct contact, and make sure names of individuals and school districts are spelled correctly. Do not fold your documents - send them in a full-sized envelope. If you are unable to personally deliver your resume, send it by overnight express to demonstrate your strong desire for the position and make a lasting impression. Of course, if you feel that you don't have the time, energy, or expertise to develop your documents, Email Candace at A+ Resumes for Teachers by clicking here - we would be glad to help you.